For us, the focus has always been on safety, and relying on proof of product effectiveness. While many of our products have been researched, it is vitally important to us to strike a balance between traditional medicine and modern science-making us a unique dietary supplement company that can offer traditional herbal supplements, as well as those that are backed by science. Our commitment to the industry we helped create has never wavered. As the first major U.S. dietary supplement company to be certified as an organic processor, our relentless pursuit for quality is evident in our product line. We offer an extensive range of health-promoting products that have been carefully scrutinized and tested, all while adhering to Good Manufacturing Practices so that we can guarantee them to exceed expectations. When under physical, emotional or mental stress, changes may occur within the gastrointestinal environment. 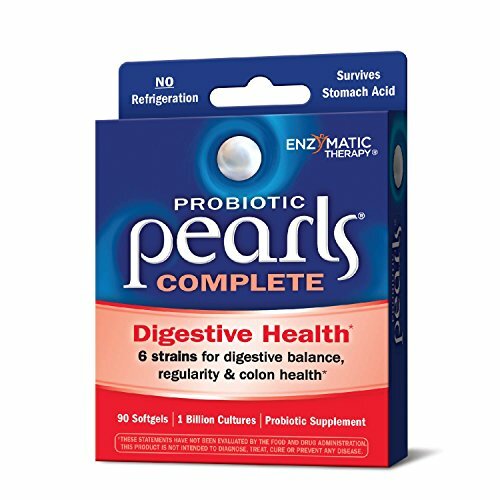 Probiotic Pearls Complete provides a blend of human strain probiotics to promote intestinal care and colon health. The Smarter Probiotic-Gets where you need it, when you need it! Probiotic Pearls Complete features True Delivery Technology which guarantees the active cultures SURVIVE stomach acids, ARRIVE in your intestines and remain ALIVE to provide exceptional support. The essence of better health-delivered. View More In Digestion & Nausea. If you have any questions about this product by Enzymatic Therapy, contact us by completing and submitting the form below. If you are looking for a specif part number, please include it with your message.